Discovering oil in New Jersey is not usually the happy occasion it may be in other parts of the world. Most often, it means trouble. But the problems discovered a few years ago in Newfoundland, had an interesting history. The first major oil pipeline in the United States, built by the Standard Oil Company, ran from Olean, New York to Bayonne, crossing Sussex and Morris Counties in the New Jersey Highlands. The first 6-inch line from Olean to Bayonne was laid in 1881 and spanned a distance of 315 miles; the second 6-inch line was laid in 1882; the third in 1884; and finally, the fourth one in the late 1880s, making the total capacity of the system over 50,000 barrels a day. Sketch of the first major pipeline in the United States that transferred crude oil from Olean, New York to Bayonne, NJ showing locations of pumping stations. At first, the company directors worried that the project would never turn a profit as the oil fields in Olean were estimated to run dry within fifteen years. 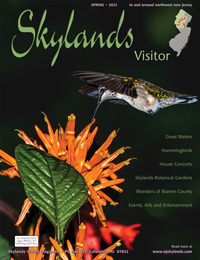 They could not foresee that new, yet-to-be-discovered oil fields in Pennsylvania, West Virginia, Ohio, Indiana, Illinois and other locations would keep oil flowing day and night through the Olean-Bayonne line for more than 45 years, yielding a return many times the original investment of five million dollars. The intent was to run the line as straight as the landscape allowed, without making any attempt to avoid river crossings or mountain ranges. Running due east from Olean before dipping south and finally crossing the New Jersey state line at Unionville near Oil City Road, the line crossed fourteen rivers, twenty creeks and eighty mountain peaks, varying in heights from 1,400 to 2,530 feet. One of the few, if not only, remaining pumping stations in existence. The buildings are intact but the pumps and boilers have been removed to make room for its current function. The lines were buried to a depth of 18 inches in the ground. In very cold weather the oil thickened, and movement would slow especially in the exposed stretches. Hot salt brine coming up with the oil in the well would be carried in the pipe along with the oil to help keep the oil flowing. This same technology is employed today in Russia to move crude oil from the fields above the Arctic Circle to the lower latitudes. But as the pipes corrode from the inside out, oil escapes and causes a "spill". I was not aware that the Olean to Bayonne pipeline even existed until I was asked to investigate an oil spill in the Pequannock River. On February 12, 1996, U.S. EPA Region II was notified by the NJ Department of Environmental Protection (NJ DEP) of an oil sheen extending along the north side of the Pequannock River. After conducting a walkover of the site, the EPA initiated oil spill containment and removal under the Oil Pollution Act of 1990, due to the potential threat to the City of Newark's public water supply. That's when my friend and colleague, On-Scene Coordinator Mike Solecki, requested that I make a site visit to advise him as to how best to remove the oil contaminating the wetland. But first we had to figure out where the oil was coming from in the first place. After talking to some of the folks living in the area, we learned that the spill site had once been the location of a pumping station on an oil pipeline that transported crude oil from the Southern Tier in New York State to refineries in Bayonne. The pipeline contained 11 similarly constructed pumping stations along the way, each one approximately 28 miles from the last. The significant NY pumping stations were in Olean, Wellsville, Cameron Mills, West Junction, Catatonk, Osborne Hollow, and Hancock. The New Jersey stations were located in Newfoundland, Saddle River, and Bayonne. Each station was equipped with duplicate boilers, engines, and Worthington pumps so that in the event of a breakdown, the oil would continue to flow without interruption. (Worthington is a big name in industrial pumps but also is a name well known in the Highlands as being associated with the family summer estate that became Worthington State Park at the southern tip of the New Jersey side of the Delaware Water Gap.) 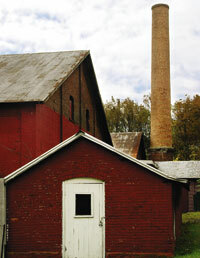 The boiler houses contained seven 80-horsepower steam boilers. (Below) The recovery and monitor wells are now permanently capped. Along with the actual pumping machinery were a number of large cast iron tanks that held the oil before it was pumped into the next portion of the pipe. The problem, we learned, was that these tanks were constructed without any bottoms other than compacted earth. The oil/water mixture was pumped into the tanks with the hope that the oil would separate and float on the water in the tank. Unfortunately, this bottom water did not always serve as a seal, and oil seeped into the soil beneath. Over the forty-year operation of the pipeline, unknown quantities of oil were lost to the underlying soils. At the Newfoundland pumping station, it took nearly a hundred years for this subterranean oil sitting on the groundwater to finally make its way out to the adjacent marsh and subsequently into the nearby Pequannock River. By March, hydro-geologic and geophysical investigations were completed in order to assess the extent of groundwater contamination and to establish groundwater flow conditions. Scores of shallow soil borings were completed so that soil, groundwater and oil samples could be collected and analyzed. In August 1998, a product (oil) recovery system consisting of a 30-foot deep, 6-inch diameter recovery well, and a groundwater injection gallery were installed 150 feet upgradient (above the level) of the extraction well. In addition, a monitoring network made up of 2-inch wide monitor wells was installed to better define the thickness and movement of the oil layer. A two-phase pump recovered oil and water separately from the extraction well, and the product was then pumped to an on-site storage tank. The untreated groundwater was reinjected upgradient to encourage the oil to flow towards the recovery wells. Subsequently, an additional recovery system was installed that included a 100 foot interceptor trench 30 feet deep with another recovery well on the down gradient end that increased the efficiency of recovering the oil. 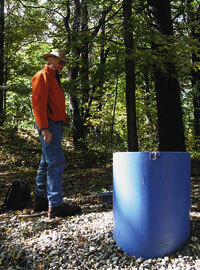 The author revisits the site of his handywork, one of the recovery wells. Stream bank stabilization and anti-erosion devices (coir logs) were installed by the EPA with the technical assistance of US Department of Agriculture's Natural Resource Conservation Service (NRCS) and the U.S. Fish & Wildlife Service in the autumn of 1998. The initial response by the City of Newark had removed several inches of contaminated soil and vegetation from the marsh. 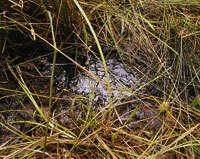 A revegetation and planting scheme was formulated by the NRCS and implemented in spring, 1999 consisting of planting mostly woody wetland species to simulate the wetland type on the opposite shore. Herbaceous and grass species were planted on the coir logs at the river edge. Thus far, better than 90% survival has been observed, and this project has served as a model for revegetating and restoring contaminated habitat at oil spill and brownfields sites across the country. The recovery of the subsurface oil at the Newfoundland site was terminated in the fall of 2005 with more than 60,000 gallons of oil being removed. Oil is no longer seeping into the wetland and contaminating the Pequannock River, the main waterway that connects all the major reservoirs of the City of Newark's water supply in the New Jersey Highlands. The site is visited on a regular basis, especially in the spring following the snow melt, to see if any oil still present on the groundwater might be seeping into the marsh and threatening the nearby Pequannock River.